Of course, the best doughnuts I ate were those peddled out of a food cart in Scotland. Deep fried, spongy and dense at the same time, coated in caster sugar. Yumm - with a cup of steaming hot cuppa:) For the challenge I chose to make baked doughnuts using a recipe that is slightly different from the one provided. I made two types of baked doughnuts, jam filled and coffee glazed. Both come out delicious. Sift together the flour, granulated sugar, yeast, cinnamon, and salt. Mix until combined. Pour in the oil, butter, and milk, blend in to combine. Add the egg whites to achieve an elastic dough. Lightly oil a large bowl. Transfer dough to that bowl and cover loosely with plastic wrap. Let rise 40 minutes or until doubled in bulk. Punch down dough, folding it onto itself. On lightly oiled work surface, gently roll dough into an eight-inch log. Cut the log crosswise into 1-inch pieces. Shape each piece into ball and transfer to prepared cookie sheets, 3 inches apart. Cover with loosely with lightly oiled plastic wrap and let rise 20 to 30 minutes or until slightly puffed. Preheat the oven to 350°F. Brush tops of dough with milk. Bake, one sheet at a time for 12 to 15 minutes or until pale golden. Cool on sheets on wire racks 5 minutes. Cut 1 corner of self-sealing plastic bag to make 1/4-inch-diameter hole; fit with 1/4- to 1/2-inch plain piping tip, and fill bag with jam. Slide paring knife into center of side of 1 donut without cutting through other side. Using sawing motion, cut pocket in donut without cutting opening any wider. Fit piping tip into hole, and pipe jam until filled. Repeat. 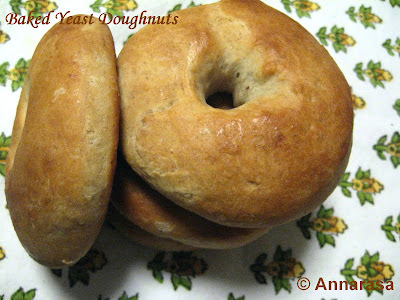 For the glazed doughnuts, prepare the glaze, dip the doughnuts, and allow to dry. Dust doughnuts with confectioners' sugar to serve. Postscript: The October 2010 Daring Bakers challenge was hosted by Lori of Butter Me Up. Lori chose to challenge DBers to make doughnuts. She used several sources for her recipes including Alton Brown, Nancy Silverton, Kate Neumann and Epicurious. All content, text and photographs in this blog, unless otherwise noted, are Copyright of © Annarasa 2007 - 2010. All Rights Reserved. Kindly do not reproduce without permission. I really like the idea of baked doughnuts, they are healthier! I do love that these doughnuts are baked and not fried. Looks soft and delicious. 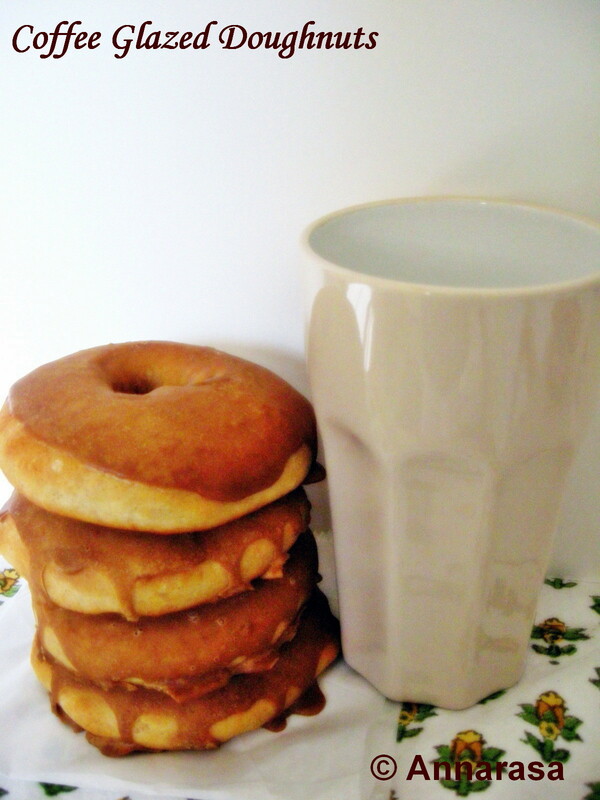 It is great that you made baked doughnuts and they look delicious. Great photograph. Cheers from Audax in Sydney Australia.